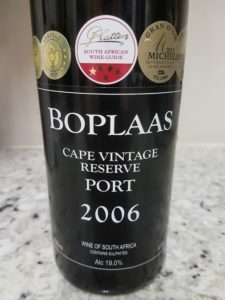 Boplaas in Calitzdorp has again made available its Port-style Cape Vintage Reserve 2006 at R1 200 a bottle along with the release of the 2016 vintage at R350 a bottle. The 2006 rated 5 Stars on release in Wine magazine and continues to show magnificently. A blend of Touriga Nacional, Tinta Barocca and Souzão sourced from Calitzdorp and Stellenbosch, the nose shows top notes of flowers and herbs before red, blue and black fruit plus a hint of spice while the palate shows great fruit concentration, fresh acidity and tannins that are smooth in the best sense. 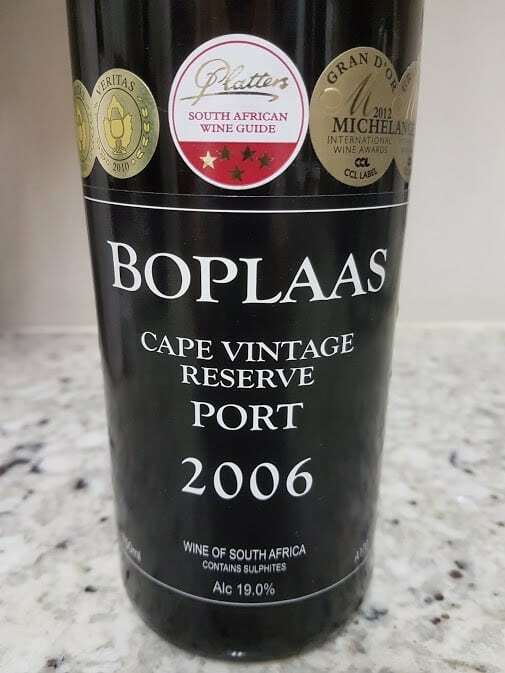 I last encountered in April 2016 (see here) and while my tasting note is very similar, I’m inclined to revise my rating upwards from 92 to 94 – this is a monumental wine which has only gained in harmony in the last two years and gives every indication of being able to last a long, long time. The 2016 is, as you might expect, very primary. Again, some floral perfume, black and blue fruit, herbs and spice on the nose. The palate is dense with lovely freshness and intense tannic grip, the finish long and dry and just a little bit earthy. Initially, it appeared rather monolithic but revisited after 24 hours, it was more giving and again, this should mature well for many years.